Follow the trails in this all-new guide, and you'll discover deep forests, secluded beaches, and unexpected wild landscapes. Jay Abercrombie deftly weaves his expertise in biology and ecology with a boundless interest in the ebb and flow of the human tide through the centuries. The Delmarva Peninsula dangles close to the Baltimore-Washington-Philadelphia megalopolis, but it has always remained apart from the fast-paced urban world, maintaining a charming agrarian and maritime flavor with strong colonial roots. The walks in this book range from easy strolls to a challenging backpacking trip, and meander through old millpond areas, 18th-century villages, historic forts, and a rich diversity of natural habitats. A mild winter climate makes this region inviting for exploration all year 'round. 40 black & white photographs, 36 maps, index. Size: 12 Mo -- 7.5 In Tall. Description: 256 pp., index, numerous maps, b&w photos. Close to new, no markings or spine creases. Abercrombie, an entomologist and field biologist, presents the agrarian and maritime flavor that lingers on the edge of the Washington-Baltimore metropolis. His 33 suggested walks range from an easy stroll to a challenging backpacking trip. The territory includes Delaware and the eastern shore of Maryland and Virginia. 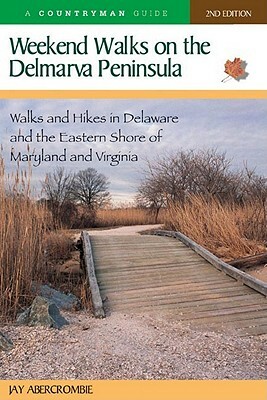 Keywords: WALKING DELAWARE_GUIDEBOOKS. ENVIRONMENT. HIKING.